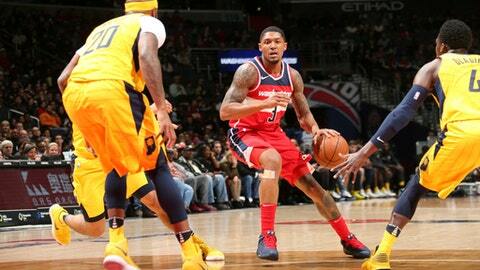 WASHINGTON (AP) Bradley Beal and the Washington Wizards delivered in a big game in the Eastern Conference playoff race. Beal scored 19 points, Marcin Gortat had 18 and the Wizards beat the Pacers 109-102 on Saturday night in a possible postseason preview. Washington (40-30) earned its second straight win to move into a tie with Indiana for fourth in the conference standings. The Wizards also claimed the first tiebreaker with the Pacers by taking two of three in the season series. Gortat was 6 for 8 from the field and 6 for 6 from the line after scoring a total of 17 points in his previous four games. He also grabbed eight rebounds. Washington went 10 for 20 from 3-point range and shot 54.8 percent from the field overall. Kelly Oubre, Jr. had 16 points for the Wizards, and Markieff Morris added 15. Reserve Lance Stephenson led Indiana with 25 points on 10-of-15 shooting. Victor Oladipo had 18 points. The Pacers committed 15 turnovers, leading to 26 points for the Wizards. The Pacers played without starting center Myles Turner and reserve forward Domantas Sabonis, who were sidelined by sprained left ankles. They had won four straight road games. Pacers center Al Jefferson, making his first start of the season, had 10 points and nine rebounds. Washington led by 12 at halftime and extended its lead to 71-51 on Otto Porter Jr.’s corner 3-pointer in the third quarter. Bojan Bogdanovic and Darren Collison hit back-to-back 3-pointers to get the Pacers within nine early in the fourth. But Washington answered with a 7-0 run capped by Oubre’s layup. The Pacers made one more charge, pulling within seven on Stephenson’s layup with 1:17 left, but Beal hit two free throws with 45 seconds remaining. Wizards forward Mike Scott starred in college for the University of Virginia. The Cavaliers fell 74-54 to UMBC on Friday, becoming the first No. 1 seed to lose to a No. 16 seed in the NCAA Tournament. Washington coach Scott Brooks was asked pregame how his key reserve was handling the upset. ”Tough loss, but he’s good,” Brooks said. ”Well, ask me after the game.” Scott finished with six points in 18 minutes. Stephenson was 2 for 3 from 3-point range. Pacers: Last won five straight road games in 2011-12. … Stephenson had 10 points in the second quarter. … Oladipo, who leads the NBA in steals with 2.24 per game, had three. Wizards: Tomas Satoransky went 4 for 4 and scored 10 points in first quarter. … Had two days off before facing Indiana and three days off before their next game. … Converted 19 of 23 free throws. Pacers: Host the Lakers on Monday night. Wizards: At San Antonio on Wednesday night.